After you file an insurance claim, the very next step in the process is to have an adjuster meeting. In our opinion, this is the most critical step in the entire process of repairing your home. What Happens at the Adjuster Meeting? Your insurance company will send a representative, called an adjuster, to inspect the damage to your home. The adjuster works for the insurance company either internally or as a third party hire. The adjuster’s job is to verify insurance claims and determine a fair amount for settlement. The adjuster will ideally (but not always) thoroughly inspect your home and either approve or deny your claim. If they approve your claim or part of it, they will write an Xactimate estimate for repair which outlines the scope of work and price for repairs. Adjusters often try to convince property owners to accept less money than their claim is worth. After all, they work for the insurance company. Insurance wants to pay for as little as possible to protect their bottom line. This leaves homeowners with insufficient funds to properly repair their homes. Some ways adjusters do this is by paying for only part of your roof or siding, not including things like county code upgrades, or flat out rejecting the claim all together. The adjuster meeting is when these decisions are made, which is why it’s so important. Although, you can make adjustments to the estimate your insurance adjuster provides, it’s a long and sometimes contentious process to do so. The most efficient way to ensure your repair estimate is fair is to agree on everything at the adjuster meeting. Modern exclusively specializes in insurance claim work and we attend over 500 adjuster meetings a year. 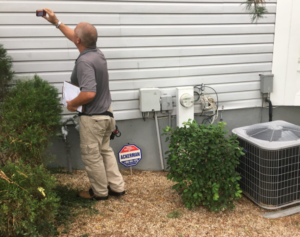 Unlike the adjuster, we work for the homeowner and act in their interest. Our project managers attend training year-round to be better educated in hail and wind damage. We’re able to point out damage the adjuster might’ve missed or remind them of local code enforcement. Call or contact us to learn more about what we do at adjuster meetings or to have us look over your insurance estimate if you’ve already received it.